First announced in June 2015: a fully functional 3D-printed stainless-steel bridge, measuring 41 ft. long, 20 ft., 8 in. wide, and weighing nearly 5 tons, and set for installation in 2019. It will span Oudezijds Achterburgwal, one of Amsterdam's most historic canals, and shows that "3D printing is entering the world of large-scale, functional objects," says its designer. Read more. 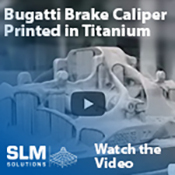 This manufacturer, headed by a 25-yr. additive-manufacturing (AM) veteran, has embraced sustainability and a unique blend of processes, as well as a tumble-finishing technology resulting in significantly reduced post-processing time. Read more. Stratasys Ltd., with operations in Minneapolis, MN, and Rehovot, Israel, has launched an industry certification program in North America, designed to bridge the AM skills gap. 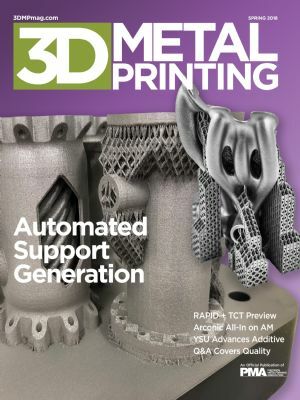 Developed in conjunction with a consortium of colleges and universities, the program aims to enable students to secure accelerated additive manufacturing credentials to improve employability and workforce readiness. Read more. Meanwhile, Additive Manufacturing (AM) for Innovative Design and Production, an online course for professionals, and the result of an MIT-Boeing collaboration, has been launched. The offering explores the transformational capabilities of AM in the design, production and service of products, and investigates its implications in restructuring production workflows and lowering manufacturing costs. Geared toward industry professionals, the new course teaches skills for implementing AM in organizations. Read more. Check out how this designer and provider of luxury kitchen and bath products, and subsidiary of Kohler Co., uses 3D Systems' ProX DMP 320 metal-AM system to produce state-of-the-art faucets. 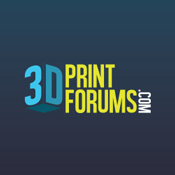 Attendees of this event will interact directly with industry experts and learn about the latest technology developments in 3D printing. Learn more about the event and register. This event will provide opportunities to learn about the latest technologies and case-study applications. Attendees also will have the opportunity to participate in exclusive plant tours at the GE Additive Customer Experience Center, and the Carnegie Mellon NextManufacturing Center, to engage with company representatives and to view 3D metal-printing machines in action. Learn more about the event and register. The savings just keep on coming, from powder conservation to reduced time for support design, development and removal. In September of 2017, Arconic revealed that it had manufactured the first 3D-printed titanium part installed on a series-production Airbus commercial aircraft. The company remains committed to AM for aerospace, and it shows. ☉ 3D Enables Rethinking of Design Approach… and that's exactly what the coolant-system experts at Grindaix and Bionic Production did. ☉ RAPID + TCT and AMUG Roundup—See what we saw at these stellar North American AM events.